The one war that never ends is how people constantly try to fight the trend. The ECB will buy bad government debt they created instead of doing what was necessary from the start – consolidate all state debt. That would have enabled the Euro to be a viable currency creating a reserve base that does not exist today. Instead, leaving each country with its own debt that was then reserve quality for the banking system was the greatest mistake in history. European banks are really in trouble. They do not mark-to-market sovereign debt. Government PRESUMES they are always the best. Europe is a failure for they just will not reform Euroland. Instead, this is like a Chinese Water torture or an NSA Waterboarding vacation – a slow gradual and painful process. This Euro Crisis cannot be resolved in such a manner. Buying in sovereign debt is DEFLATIONARY for it is effectively retiring the debt that is worthless. It is bailing out banks, not inflating the economy, since the banks will not lend that money out again. The banks will crumble to dust for their reserves are worthless. This is a very interesting problem that nobody wants to discuss publicly for it is the biggest political manipulation in history gone really, really bad. 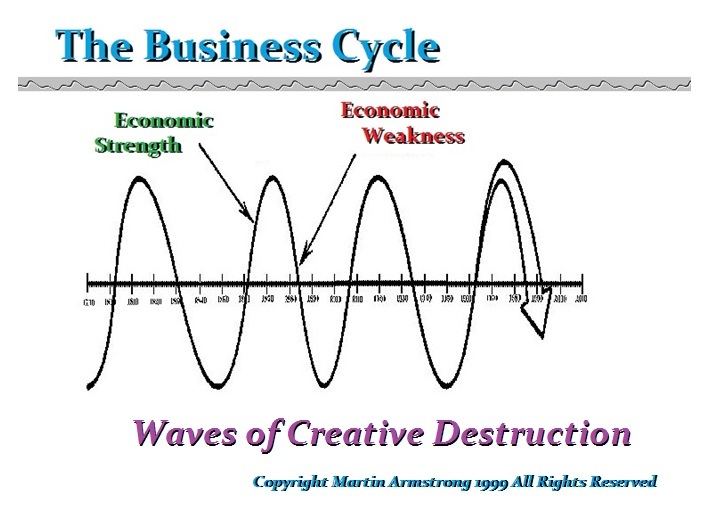 This entry was posted in news and tagged business cycles, currency wars, deflation, depression, economic collapse, Economic Crisis, Fed, fed policy, federal reserve, Gold, market trends, martin armstrong, PMC Ounce, silver, US Dollar on January 22, 2015 by Site Admin.